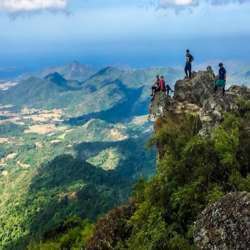 You must be a member of the Manila Hiking & Outdoors Group to attend this activity. Would you like to join this group? The summit of this mountain, a massive, monumental composite of rocky pillars; and its guardian, the smaller Silyang Bato. Its local origin name is attributed to the 'many rocks' that formed it. The major jump-off is at Barangay Ramirez in Magallanes, Cavite. It offers a fantastic Protected content view of the rocky outcrops and the scenic view of Cavite. Newbies are welcome to join this hike! Your RSVP is needed latest on Saturday Protected content Protected content you are ‘confirmed’ to join. 1. Itinerary is not absolute and may vary depends on the actual situations; weather, pacing, traffic, etc. 2. Pre-payment cannot be refunded but transferable unless in the event of unfavourable weather. 3. Text me when you have able to make the payment and keep your deposit slip for any future references. 4. Organizer has the right to cancel the event if the minimum number of participants is not reached. 5. Organizer has the right to adjust the itinerary on or before the event. 6. Organizer are not liable for any lost or damages of your valuables.